Also available with Air-Glide™ features for heavy parts. Check out the full-line catalog. Inspections performed on any equipment, by anyone! All product is in stock and can ship same day! Now Inspection Arsenal™ Quick-swap Fixtures Enhance All Portable Shop Floor CMMs! Hold Funky Surfaced Parts with the Help of New Adjustable Stand-offs! 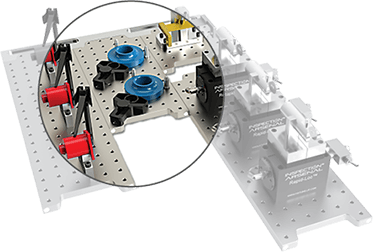 As a LEAN Six Sigma instructor and practitioner, I am delighted to recommend Phillips Precision and their Inspection Arsenal™ product line, which eliminates many non-value added setup steps through their CMM fixture plates and work holding. By “fixturing-up” and simplifying the inspection task for repeatable, and documented steps, a standard work opportunity has been created to speed inspection and increase the number of parts inspected, even with a less skilled inspector! © 2019 Phillips Precision, Inc. All Rights Reserved.